Every church pulpit and cross from Torklift Central is custom fabricated to your personalized vision and is made to complement the change of sermons in your church/house of worship. Our "sermon on the mount" pulpits can be modified to fit any series of sermons. Whether your topic is Resurrection Sunday, Christmas, Christ's Love, Relationships, or the Changing Seasons, our "sermon on the mount" is diverse enough to meet your needs. All our crosses are made from the finest stainless/mild steel, come with a lifetime warranty and are made to any size. In keeping with the "sermon on the mount" design ethos, Torklift Central's "Yahweh" cross can be changed to fit the theme of any sermon topic or message. The fully customizable cross is custom fabricated to any size. For easy transport, the cross features a modular design, meaning it comes apart in pieces for easy assembly, transport and reassembly. Every "Yahweh" cross from Torklift Central is constructed of 100% USA steel and manufactured right here in Kent, WA. All of our pulpits are made from the finest stainless/mild steel, come with a lifetime guarantee and can be made to any height and width. In keeping with the "sermon on the mount" design ethos, Torklift Central's "Yaweh" cross can be changed to fit the theme of any sermon topic or message. 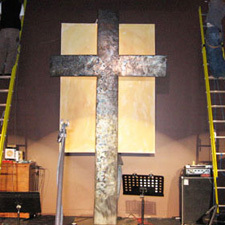 The fully customizable cross can be custom fabricated to any height or width. For easy transport, the cross features a modular design, meaning it comes apart in pieces for easy assembly, transport and reassembly. Every "Yaweh" cross from Torklift Central is constructed of 100% USA steel and manufactured right here in Kent, WA. * Cross is constructed of steel tubing and optionally available in stainless or aluminum. * Cross comes complete with hardware for assembly.